The last two generations of iPhone have stayed the same size with the iPhone XS and iPhone X flagships both sporting 5.8-inch displays, but it looks like that could change for the iPhone 11. According to Japanese site Macotakara, who previously suggested that the iPhone 11 will come with a triple-lens rear camera array, states the iPhone 11 will be bigger than the iPhone XS, although the iPhone 11 Max (as we're calling it for now) will stay the same size as the iPhone XS Max. The report says the iPhone 11 will have a 6.1-inch display, which if correct would make it the same size as the current iPhone XR. However, the 'plus-sized' iPhone 11 will stick to 6.5-inches, as its predecessor did. What do we expect iOS 13 will bring? 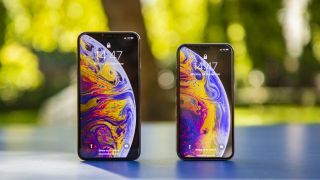 The real change in size, the report suggests, is in thickness, as the main iPhone 11 is set to be 0.15mm smaller than the iPhone XS and the iPhone 11 Max will be a substantial 0.4mm thinner than the iPhone XS Max. Since iPhones are traditionally a little thick and heavy, this could be a noticeable design change. The report also suggests these two handsets will have the previously-hinted three-camera setup on the rear, implying a 'lite' version will have a weaker array than the others. The iPhone XR had a single camera, compared to the two of the iPhone XS, so if the report is correct it's likely each tier of device will gain one camera on its predecessor. The actual size of the 'lite' model isn't mentioned, but if the iPhone 11 is a step up in size it's possible Apple is reordering the series so each phone is a step up in price and in size, like the Samsung Galaxy S10 range, instead of the iPhone XR actually being bigger than its more expensive sibling. While we can't know for now if the report is accurate, it directly contradicts previous rumors which suggested the iPhone 11 will be the same size as the iPhone XS, and the 2020 iPhones will actually be smaller, so take this report with a pinch of salt. Could the iPhone 11 or Apple Watch 5 monitor the way you smell?